Hey, lovely! 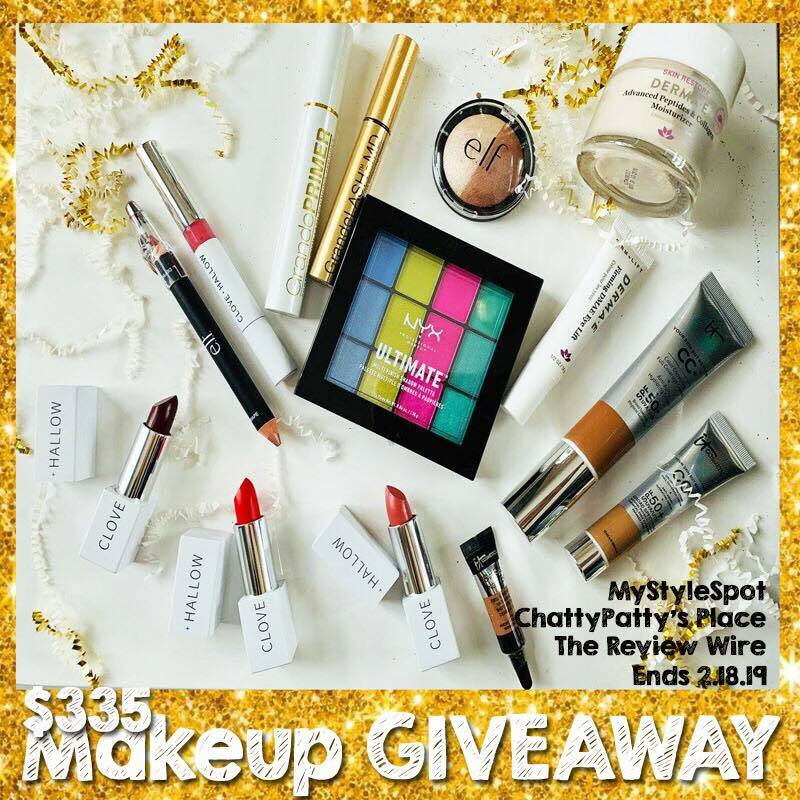 Welcome to the MyStyleSpot, Chatty Patty, and the Review Wire’s HUGE makeup and skincare Giveaway! Plus Read these fab tips on – 12 Essential Skincare Tips for Oily Skin. Giveaway open to U.S. Residents! I’m excited to try the Grand Lash MD Eyelash Formula,it sounds amazing like all the other products in this giveaway! NYX Ultimate Muti-Finish Eye Shadow Palette. I’d most like to try the IT Cosmetics CC Cream. I like CC or BB creams but I haven’t tried this one. This is the most recent blog post, lol. I think all this make-up looks so impressive! I am most excited to try the Grand Lash MD Eyelash Formula. I’m most excited to try the Grande Lash MD Eyelash Formula and the Dermae Firming DMAE Eye lift cream! Between the both of those my eyes would be amazing!! I haven’t tried almost any if these! I’m most excited to try the Dermae Firming DMAE Eye Lift Cream because I’m looking for a new eye cream. The eyeshadow palette is intriguing! I’m most excited for the lipstick’s and liner, and everything will be great as I could really use more! I’m most excited about the Dermae Advanced Peptides & Collagen Moisturizer. The whole package sounds amazing and really generous too! Either the Dermae Advanced Peptides & Collagen Moisturizer or the It Cosmetics CC+ SPF 50+ Anti Aging Hydrating Eye Cream would be my choice. I really want to try the It Cosmetics CC+ SPF 50+ Anti Aging Hydrating Eye Cream. I’m most excited about the Elf Cosmetics Baked Highlighter & Bronzer in Bronzed Glow. They all sound great but I am most interested in the pre-mascara. Thanks for the opportunity! I am most excited to try the Grande Lash Primer Pre-Mascara. I’m excited to try the eye lift cream! Thanks for the opportunity! Good luck to everyone! They all sound amazing. I am most excited to try the Grand Lash Primer Pre-mascara. Id love to give the peptide moisturizer a try,it sounds awesome. I’m most excited about winning the Dermae Eye Lift Cream! Thank you for the chance! I’m most excited to try the It Cosmetics products, especially the It Cosmetics CC SPF 50+ Cream in Deep. Honestly I am not sure, which I like the most. I have never tried any of these products but I really could use some good makeup, so I thank you very kindly for the opportunity! Good Luck to all and have a great week! I just have to get my hands on the Clove and Hallow Lip Creme Lipstick in Psych $20! That would be my first choice then the NYX Palette for sure! I cant wait to try the Dermae Firming DMAE Eye Lift Cream! Im most excited to try the It Cosmetics Bye Bye Under Eye concealer. I am most excited about the Dermae Firming DMAE Eye Lift Cream! I’d love to try the Grande Lash MD Eyelash Formula. I am most excited to try the Clove & Hollow lipsticks. I want to try the Dermae eye lift cream. I would love to try the It Cosmetics CC+ SPF 50+ Anti Aging Hydrating Eye Cream. I’m most excited about the NYX Ultimate Muti-Finish Eye Shadow Palette. The NYX Ultimate Muti-Finish Eye Shadow Palette looks amazing. I would give the products to my daughters and think they would be most excited to try the Elf Cosmetics, It Cosmetics and NYX products. I’m the most excited to try the IT and DERMAE anti-aging creams and moisturizers! I’ve been dying to try IT Cosmetics’ bye bye foundation forever but have never had a chance but at least would love to try the skincare! I am most excited to try the Grande Lash Primer Pre-Mascara. Thank you for this chance. Excited About All The Goodies Hard 2 Pick 1 Tsvm 4 The Chance 2 Win !!! I am excited to try the It Cosmetics CC+ SPF 50+ Anti Aging Hydrating Eye Cream. I hear it works great! I am excited to try multiple products. Mostly would love to try the Grande Lash Primer Pre-Mascara. I am most excited to try the Dermae Firming DMAE Eye Lift Cream because my eye area is what needs the most help!